Happy holidays everyone! 'Tis the season for craft shows. I caught a re-run of She's Crafty the other day and saw the cutest recycled "gift box" idea that I couldn't help but add my own spin to. It's a super easy and quick project that can involve almost 100% recycled materials. 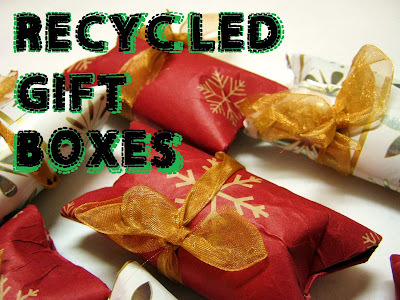 Check it out..
How to make simple recycled gift boxes. To start out, you'll need to collect a few paper towel rolls. She's Crafty suggests you use toilet paper rolls but, I don't know...personally I wouldn't want candy dispensed from a cardboard tube that's been stewing in a bathroom for a week. So, I chose just to use paper towel rolls and cut them to size (I also had a ton of these lying around, not as many toilet paper rolls.) Since it's the holidays, I challenge you to use a nearly spent roll of wrapping paper to make some boxes as well! Not only will the cardboard tube inside yield tons of sturdy boxes, but the remaining wrapping paper will be more than enough to cover all of them, too. You will also need some double stick tape. I think that double stick tape is a lot better for paper crafts that would otherwise warp if they were slathered with any kind of liquid glues. However, if you're in a money crunch or can't find any double stick tape (try Wal-Mart or a craft store like Michaels) a glue stick would probably work okay. Use a pen and mark the rolls off so that you will get three even sized boxes. You can make then any length you want, if you even decide to cut the paper towel rolls at all. It all depends on your personal taste. However, more boxes does mean more gifts! Just a side note- this may seem like a small detail, but it made things a lot easier when it came to cutting out these paper towel rolls. Your first reaction may be to use scissors to cut out your paper towel rolls, like mine was. But don't do it. As I quickly discovered, your cut will come out all jagged and lame. Instead, try this..
Definitely use your X-acto blade (or box cutter) to chop up your paper towel rolls. Not only will the process be faster and easier, but the cut will come out much neater. My x-acto blade laying triumphantly beside all those cut up paper towel rolls. You go girl! In this tutorial, I decided to use Christmas wrapping paper to decorate my boxes. However, what type of paper you choose is completely up to you. If you want to take out the holiday look of the boxes, choose a more neutral paper. If you're really adventurous you could even try using fabric or vinyl to cover the rolls. The amount of paper you'll need to cover your paper towel rolls can be approximate. Obviously, the idea is to have enough to completely cover the cardboard with a little bit extra for the edges. Lay your paper flat out and cut it slightly longer than the length of your boxes. Then, roll the tube up in the decorative paper to get the length you'll need to cover it completely. Once you get a good paper size, use it as a template to cut out more of that same shape. At this point, you'll need to start putting double stick tape on the back of your papers. Luckily, you won't need to cover the entire paper with tape. A single strip on all four sides will hold it down good enough. Pull off the sticker backs and carefully roll the cardboard tube around your paper. The tighter and smoother you can get the paper to adhere to the roll, the better your gift boxes will look. This awesome two sided paper is left over from some presents I got to open up early! This is a great use for all that left over wrapping paper after Christmas. Try cutting up a few pieces and using them for a gift box wrapper. Don't worry if the paper is a little crunched up...The wrinkles do not show up hardly at all once the paper is applied to the cardboard tube. You will most likely have some "extra" paper hanging over the edge of your cardboard tubes. You can either trim off this excess, or you can be fancy and fold the excess over the edges for a slightly more refined look. If you put your double stick tape close enough to the edges, you should be able to simply fold them neatly over the side of the paper towel roll. Folding the ends is quite simple. Start by flattening the paper roll somewhat, squashing it down so that there are two sides to your "box." Then, fold these edges inward towards each other and they will naturally create a concave shape as your gift box's closure. This is the fun part! There are tons of different ways you can go about decorating your gift boxes, depending on the occasion. On She's Crafty, they put some rubber stamp designs on the boxes so that they would each have a unique print. I decided to go slightly bolder with my embellishments. I chose to add some cute ribbon to my gift boxes to spruce them up. I think the bows turned out to be a nice, simple finishing touch. ...But don't forget a candy cane on top! Alternatively, you could also a name tag, a gift card or any other little trinkets your loved ones would enjoy. These gift boxes are stuffed full of delicious chocolates. This is a fool proof present idea.. You just can't go wrong with candy! These little guys will be perfect mini presents for all my co workers, as well as thoughtful handmade additions to the gifts I was already going to give to my friends and family this year. With all my tutorials, I invite you to share your results if you make this project yourself. I want to hear all the juicy details.. How did your friends and family enjoy their recycled gifts? The biggest compliment is when they can't tell that you made it yourself. Happy Crafting! very creative! what about using toilet paper rolls instead since they are already small size. To answer your question, you can absolutely use toilet paper rolls for this project! I just chose to use paper towel rolls since you can cut them up into smaller sizes. The sky's the limit with this project, really. Nice thought thanks for share this post this very helpful for moving boxes thanks. Nice collection of gift boxes and gift bags.